Hastings Tramways Company was founded in early 1904, and construction of the Hastings Tramways, including the building of Silverhill depot, started in the summer of 1904. The first tramcars arrived in July 1905 with testing taking place from 15th July 1905. The first day of public service was 31st July 1905 running the circular route and a further line from Ore to the Market Cross in the Old Town was opened in August. The London road extension from Silverhill depot was opened in July 1906. A second depot was build at Bulverhythe and services started between St. Leonard's and Bexhill on 9th April 1906. That line finally reached the isolated outpost of Cooden (then called Kewhurst) on 28th July 1906. On 12th January 1907, the two systems were connected along the seafront. It was double track operated by the Dolter stud contact system. But by 1913, it was considered dangerous and all seafront-running cars were fitted with petrol engine attached to a dynamo which fed the controllers with electric. The first petrol car ran in 1914. The petrol experiment didn't last long and the council allowed over-head wires along the front in 1921. At it's height, the total length of the route was just short of 20 miles. In the mid-1920s, the council began to think of other options instead of the trams. 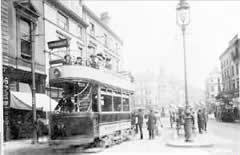 Finally, on 1st April 1928 the conversion from trams to trolleybuses started with the last tram running on 13th March 1929 thus ending the Hastings Tramways. The map below shows the Hastings Tramways Company routes circa 1910. These are overlayed on a modern-day Google map so buildings, roads and other landmarks may have changed over the past 100 years. Although the trams disappeared over 80 years ago, there is still some evidence left of the trams in Hastings. The Hastings Trolleybus Restoration Group website has two pages of information and photos of what remains. Hastings Chronicle has collated a collection of historic newspaper articles from local newspapers around Hastings. This page shows historic articles from 1891-1906 which are related to the conception and construction of Hastings Tramways. The Hastings Observer Bygones website has two pages dedicated to the memory of Hastings Tramways.